As chair of the Science and Technology Committee Norman Lamb gets to look into all sorts of whizzy and exciting issues, from the rise of artificial intelligence to quantum technology. He, more than most MPs perhaps, has a window on the future. And despite all the talk of robots taking over our jobs or social media companies colonising our thoughts he admits he favours a vision of the future that is closer to the cartoon utopia of The Jetsons than a gloomy dystopia portrayed in something like Blade Runner. “I instinctively favour a more optimistic view. 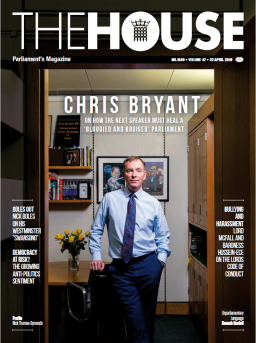 If you’re a Lib Dem you have to be optimistic,” he laughs, as he sits down with The House ahead of British Science Week. Lamb’s approach is demonstrated in his committee’s high-profile inquiries into the impact of social media on children and how algorithms increasingly apply in everyday life. He wants to know about the benefits of screen time and how algorithms can make life easier as well as any downsides. Scientists and researchers are used to a global outlook, and Lamb fears that if visa rules that currently apply to immigrants from outside the EU are applied to European experts the results would be “disastrous”. Key research, he says, could leave these shores and take place elsewhere. “Foreign students, foreign post grads coming to this country, earn this country very substantial sums of money,” he says. “It’s not just the earnings to this country it’s the sense it’s in this country’s interest that we are engaged in the ground-breaking research here that meets the big challenges that we face. “If you can’t bring together the teams of the best people because the rules create a sort of friction that makes it a less attractive place to come. That will be a great loss to this country. There is an urgency to tackling the future relationship between the UK and the EU when it comes to science and technology because Horizon 2020, the multi-million-euro EU research fund is coming to a close – as it says in the title, it ends in 2020. He wants to see the British government take the initiative. “This is actually an area that ought to be completely uncontroversial. There’s no-one out there manning the barricades with their protest placards saying ‘End Collaboration in Science Now’. How confident is he that that is going to happen? “I’m not confident,” comes the reply. “I’ve seen no real sign that it’s likely to happen any time soon.” That notorious Lib Dem perkiness only extends so far. But he’s surprisingly upbeat about the Lib Dems themselves. The party marked its 30th anniversary at the start of this month. It didn’t really celebrate because with fewer MPs than they started with in 1988 there doesn’t seem many reasons to be cheerful. Lamb doesn’t exactly fit in the system as it stands. He’s a huge fan of cross party working. Just over a year ago he launched a cross party convention on the NHS and care provision in an effort to change the health service’s traditional role as a political football. He’s more optimistic about another cross-party campaign he supports to give those suffering mental health issues ‘recovery space’ when faced with money worries. The government has indicated it supports the idea of ‘breathing space’ – forcing financial companies to back off when customers report mental health episodes to give them time to get debt advice. Recovery space would extend the idea to those too ill to manage their finances alone or get debt advice. Mental health is an issue close to Lamb’s heart. His son has struggled with Obsessive Compulsive Disorder and his sister took her own life. He has spoken out, campaigned and tried to hold the government to account for its promises. He’s using his role at the head of the Science and Technology Committee to champion the issue in innovative ways. Which rather sums up Norman Lamb’s approach to the science and technology committee. Drop in a bit of popular and populist science like driverless cars or social media but harness the heft of the committee to delve deeper and wider into the world of science. Lamb’s consensual approach would lead many to put him in the latter category. The true test will be what he can achieve as committee chair.